What Ever Happened To… Mr. Wrestling II? It was his enjoyment of the art of pure wrestling that kept Johnny Walker in the business for 36 years. Gorgeous George, one of the big names in the wrestling world, comes back to the Saskatoon Arena ring on Thursday night for a match against John Smith. It will be the headliner of the card. Mat fans are asked to note the change in date for this week only. George, who is decked out in fancy costumes and platinum blonde curls, created quite a sensation in wrestling with his appearance. He is accompanied by his wife, who acts as his valet. Two new faces will be introduced. One of them will be The Mongol, a new arrival from Manchuria who will trade holds with Rubberman Johnny Walker. The other newcomer is Larry Henning, a former University of Minnesota footballer, who will run up against Torri Torres. Rounding out the card will be an Australian tag team match. Gentleman Ed Francis and Gino Marella will tangle against Dave Ruhl and Mighty Ursus. Gorgeous George may have been the most gorgeous guy on view during Pavilion wrestling shenanigans Friday night but he didn’t come out of the scrambling a winner. Gentleman Ed Francis dumped the famed mat dandy in straight falls in about 25 minutes, the first on a disqualification and the second via the sleeper hold. A near-capacity crowd watched Mighty Ursus and Dave Ruhl take a come-from-behind best-of-three fall victory over Alberto Torres and Johnny Walker in one of the two tag matches. The Brunetti brothers, Joe and Guy, also came from behind to defeat the fiendish duo of John Smith and The Mongol. The winning teams clash next week with the international tag crown at stake. Eric The Red lost $50 in his forfeit challenge to pin Gino Marella within 10 minutes. His money boosts the pot to $150 and another grappler will go after that prize next week. 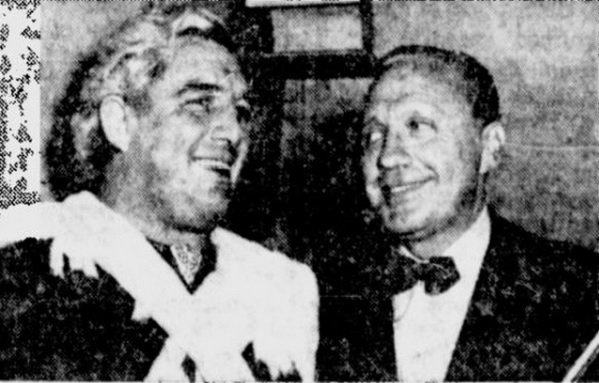 It’s also likely that promoter Stu Hart will give Smith another crack at Francis in what would be a main event battle. Chief Little Wolf, full-blooded Indian, scored an unpopular victory over Johnny Walker of New York in last night’s main event wrestling bout at Civic Center. The crowd was small, but it was rewarded for its attendance by being treated to about the best mat show that has ever been staged here. The main event result was unpopular because Little Wolf displayed dirty tactics throughout the match. In the semi-windup, Antone Leone of New York scored a two-fall win over Kay Bell, big, handsome Seattle boy who was making his debut here. “Dazzler Jim” Clark, a big fellow, won over Mickey Gavas, nice-looking Greek boy, in the special event which opened the card. Another show will be offered to fans next Thursday night.